Car Key Replacement Stevenage by Access Denied, can implement car key replacement for almost all makes of vehicles. We have a suitable team and have a mobile setup including all the parts needed for car key replacement. Choose Access Denied, Stevenage & Auto Locksmith Services. 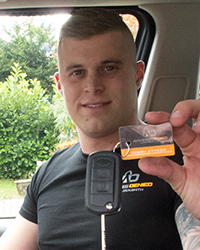 If you’ve lost your car keys, then Access Denied can supply Car Key Replacements in Stevenage. Our team can replace keys – even if you don’t have any of the originals! We carry stock on board for almost all makes of vehicle. We also have a mobile work-station to allow key-cutting & programming anywhere in Stevenage. We come to you, so you can carry on with your journey freely. Access Denied has a mobile work station. Our facilities allow us to provide road side support with 24/7 emergency cover in Stevenage. This is inclusive all of our services from Key Cutting to Auto Locksmith work. Our top high end facilities allow us to be with you and supporting you within 30 minutes of a call. Up until recently getting replacement car keys cut was a simple task. But now car keys have all sorts of components built-in to handle the extra functions: central locking, alarms, immobilisers etc. Having the confidence to know where to get a car key replacement in Stevenage is important, and not just for lost car keys. There’s also getting extra keys cut and programmed to match your car, so that you have spares in case you lose them. Then there’s changing the batteries, transponder chips and even buttons and cases too. It doesn’t stop there. After regular use buttons will stop working, some manufacturers being worse than others. A well-established car key replacement company will be able to get the right type of key fob and transfer the electronics and battery from your old key. Water damage is also an issue. An older key would have no issue with getting wet but with all the electronics and batteries in modern car keys, water can be an issue. Sometimes you might be able to dry the key out, but the key is not always able to be saved. The water will still be around the metal parts and the miniature circuit board. Eventually corrosion will eat away at the contacts and tracks on the boards and the car key will fail. So if you have misplaced your key into water, it’s well worth arranging a trip to a car key replacement company in Stevenage to get some alternatives before your original set stops working! If your car key has broken, make sure you keep all the components. If it’s snapped off in the lock, then a good car key replacement firm will extract the metal part but they will need the plastic shell and the parts inside it to use in your new key. It can be done without those parts but it will take longer and cost more, so try and keep all the parts you can. We promise the best price for car key replacement. We believe we are the most cost effective option, and will beat any other locksmiths in your local area on price and customer service. Please contact us about car key replacement Stevenage. At Access Denied we provide full car key duplication. If you need your Car Key Duplicated in Stevenage we can use your current keys and create new ones. We also carry out full programming of any new keys if you would like them synchronised to the car. We offer basic keys as a lower cost solution if you just want a back-up without the programming. If your car key requires reprogramming in Stevenage, we have a qualified team of professional engineers that can assist you. In several cases, the key fob tends to be damaged but we can simply replace these. Along with reading glasses and daily medications, car keys are one of the most commonly mislaid objects among men and women. Fortunately, following a frantic search of every nook and cranny in your home, they don’t usually stay missing for too long. However, there isn’t always a happy ending to the frenzied search for missing car keys. There are occasions when they simply can’t be found, nor will they be found. If you find yourself in the unfortunate position of not having a replacement pair of car keys, decisive action must be taken promptly. Without your car keys, your car is rendered completely useless to you. And without your car, life suddenly gets an awful lot trickier. Not only do you need your car to get to work, there are all the other important journeys that need to be factored in – school runs, ballet classes, football training, the weekly grocery shopping. The list goes on. The best course of action for an auto locksmith in Stevenage. When you finally give up searching for your car keys, your first port of call should be to get in touch with your local auto locksmith in Stevenage. The make and design of your car should not matter too much. Auto locksmiths have vast experience gaining access to all kinds of vehicles, from the most modern cars, vans and trucks, to classic vehicles that are only rarely spotted out for a Sunday drive. As long as you get in touch with your local car locksmith and run him through the details of your vehicle, they will help you to gain access to your motor in a prompt and efficient manner. When you are back on the road, you should probably start thinking about getting a spare car key. But that piece of advice is entirely optional. If your keys are locked inside the car, then a professional auto locksmith in Stevenage can pick the car’s lock. Don’t attempt to do this yourself! This is a difficult procedure and Auto locksmiths are professionals who have received a considerable amount of training and are able to do this without damaging your vehicle. As well as car key su Stevenage residents are likely to also want a new fob and a replacement transponder key if the car is made after 1995. A transponder chip is embedded in the key to stop the immobiliser system and enable the car to start. Without this, you would not be able to drive the car anywhere. Modern cars all come with central locking systems, making it easy to quickly open and shut a car, or just the boot if required. Transponder keys – specifically programmed to each car, remote car keys, key fobs, and standard car keys can all be replaced by an auto locksmith for most types of vehicles with the right information. Some of the problems we provide services for include: Snapped Key/s, Damaged Key Fob, Keys Broken in Locks, Jammed Car Keys, and Jammed Ignitions. Access Denied Auto Locksmiths use the safest forms of non-destructive entry to your car to ensure high quality repairs with no damage. We only use quality approved products and will only carry out work that’s necessary.